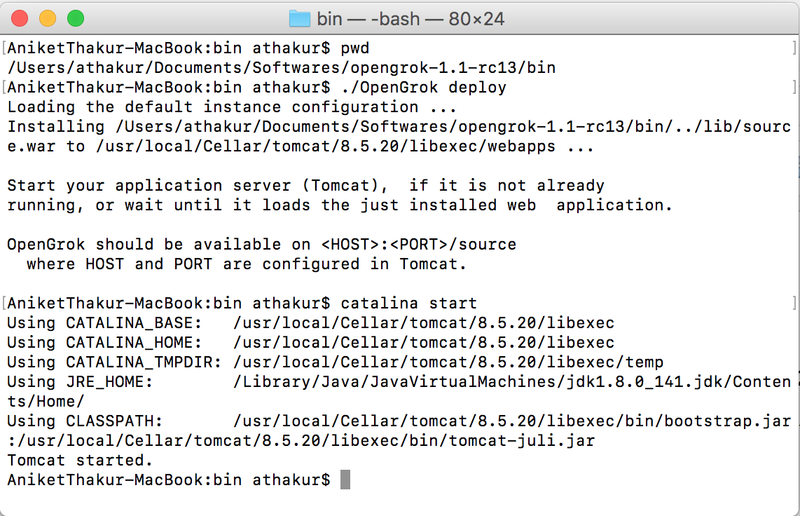 In previous couple of posts we saw how we can setup git repositories, install git client and maintain your codebase. 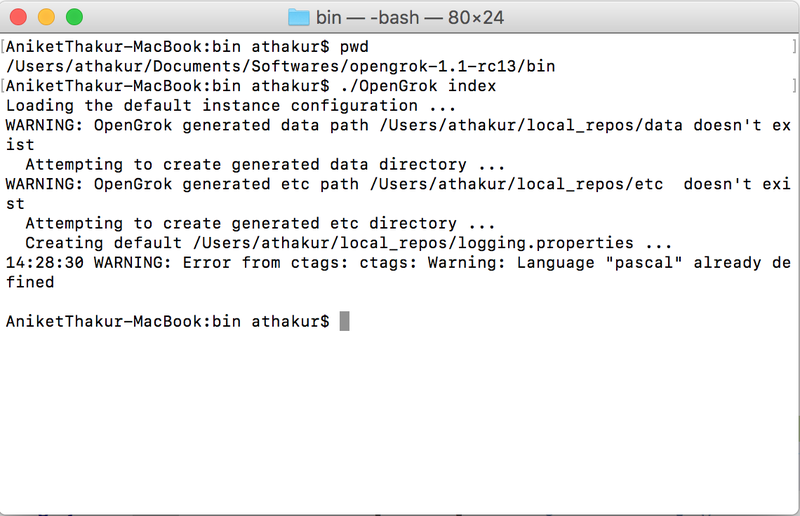 In this post we will see how to set up opengrok. 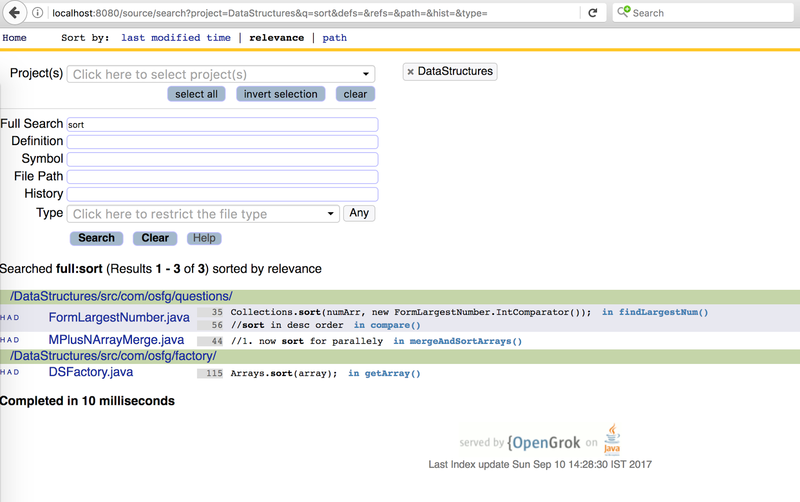 This is a code base search tool that you can use to index and search your huge complex codebase. I am going to show this on my mac laptop. If you want to setup a proper server please refer to official documentation. A servlet container like GlassFish or Tomcat to run and deploy your grok server. 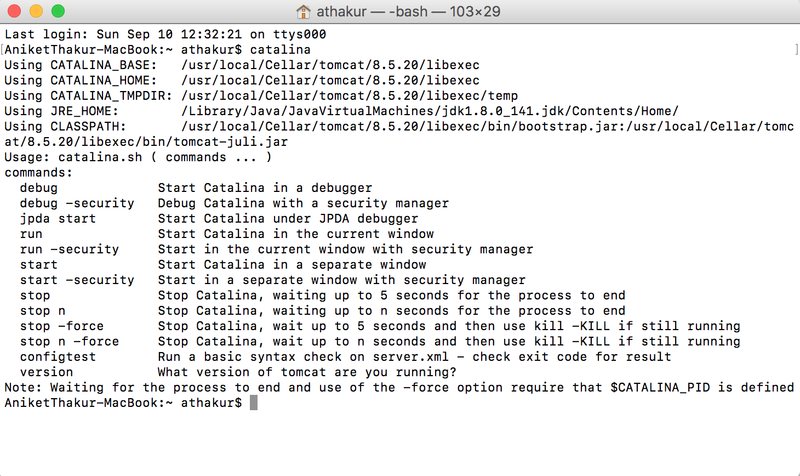 I will use tomcat. For path you can refer to catalina screenshot above. 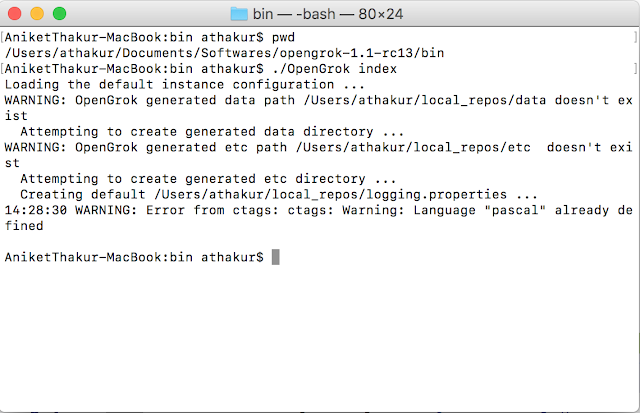 This environment variable will basically tell where grok needs to be deployed. 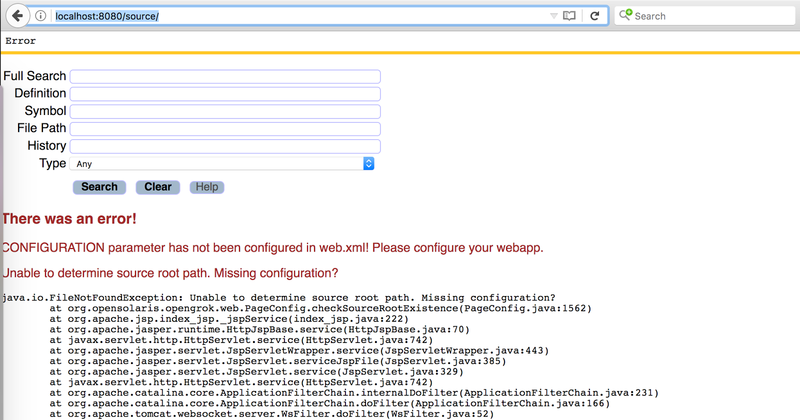 The error you see is ok since we have not provided our codebase source directory yet. That's it you can refresh grok page and start searching code. NOTE : For every update to your actual repository or for any new repository getting added you need to call ./Opengrok index to index it. 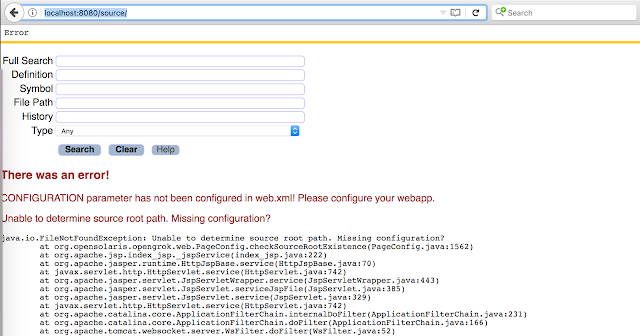 You can probably write a cron job that does an automatic pull of your repository and runs index on it. In this post we will see database indexing more from a development design perspective. Many of you might be of the impression that database indexes, tables , performance, lookups maybe responsibility of database admins. Though this might be true to some extent indexes selection, and constructing where clause is developers responsibility and poor choice of indexes and where clause may often lead to performance issues causing queries to run slow. So whenever you are developing an application that requires database interactions as a developer it is very important that you design your indexes first. How do we do that? - We will see that in sometime. Step 1 is limited is size as tree height/level will be limited by log N constraint. For millions of rows there could be 3-4 level of the tree. It will be extremely rare to see a B-Tree with level more than 5.
blevel gives you the levels of your B-Tree index. Plus one is for the leaf node. So these are the number of levels that needs to be traversed to get an index at the leaf node (considering unique scan). 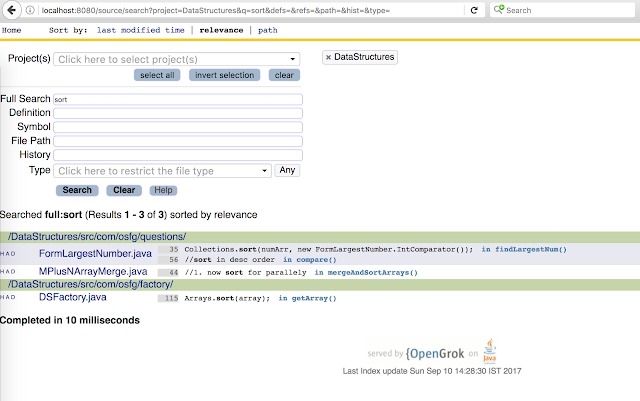 Step 2 and Step 3 can vary and in most cases are causes of slow index lookup resulting in slow running queries. And you should see the plan that was selected to run this query and associated cost. As you can see a "FULL TABLE SCAN" was selected. Since your where clause has department column in it there was no other option. Unique index starting with name could not be used. Primary key index could not be used (Index is always created on primary key -id in this case). So it had to go for a full table scan. Now this is obviously expensive. You can see the cardinality is 6 which basically means there are 6 rows which satisfy "department='IT'" clause and cost is also high. Let's do something about this. Let's create an index in column department and then again inspect the plan. Hope this clears how indexes help faster execution of queries. Cardinality is the estimated number of rows a particular step will return. Cost is the estimated amount of work the plan will do for that step. Higer cardinality mean more work which means higher cost associated with that step. A lower cost query will run faster than a higer cost query. Notice how there was no traversal among lead nodes and no consequent batch access by row ids. As expected it is same as primary key index. Instead of primary key index it used unique index we created on our own. Steps are same too. Remember our unique index - name, age, department . We saw in the 1st case where we had department in where clause (before creating an index on department) that this particular index was not used and a full table scan was performed. As expected our index got used and a full table scan was avoided. However if you use age in where clause index will not be used again - since none of your index starts with age. Try it yourself! And that concludes - order of columns in where clause does not matter! As you can see index on name was selected and once leaf nodes were retrieved filter was applied in it to get those rows with department='IT' and finally batched rowid access to get all the table data. This index was selected probably because unique indexes are given preference over non unique index since they are faster. But it depends totally on sql optimizer to figure that out based on execution cost. Take some time to think this though based on our discussion so far. We know where clause has name it it. We also know we have an unique index that starts with name. So it will be used. On top of that we have an added bonus - we just need name,age,department that us already part of that unique index. So we really don't need to access to actual table data to get any other content. As expected. There is no "BY INDEX ROWID" or "BY INDEX ROWID BATCHED". That's because table access is not needed since all required data is in index itself. Also note the range scan - even though unique index is used there is no unique row returned since only part of unique index is used. Either case you need to choose index very wisely based on your where clause, it's combination. Order of columns in index is very important. Always go for index that starts with column that is used in most of the queries where clause. Also go for equality first than range. So if you where clause is something like - "where name='Aniket' and age>24" always for name as column ordered before age. since equality will give less results to filter from. Age will be applied as filter in above case.